Ayurveda, meaning “knowledge of life” made its debut in India 5, 000-plus years ago and remains just as relevant to spa-goers today. At the center of this complex holistic medical system is the recognition and balancing of someone’s doshas (one of the three biological energies said to make up our mental and physical dispositions) through the integration of such disciplines as nutrition, exercise, meditation, massage, aromatherapy, and herbal medicine. Prominent advocates like Deepak Chopra have moved this system of preventative healthcare into the mainstream, and a wide range of Ayurvedic treatments can now be found on many spa menus. Here’s a crash course of Ayurvedic terms—study them before you hit the spa and impress your esthetician! Ayurveda stems from the Sanskrit words, ayus, or life, and veda, or knowledge. You’ll hear the word dosha come up quite a bit in the Ayurvedic world as well; it stands for three biological mind-body traits: vata, pitta, and kapha. Common rituals on spa menus include Abhyanga (oil massage), Shirodhara (the “third-eye” treatment), and Panchakarma (detoxifying therapy). CARNOUSTIE BEACH RESORT AND AYURVEDA SPA, India. 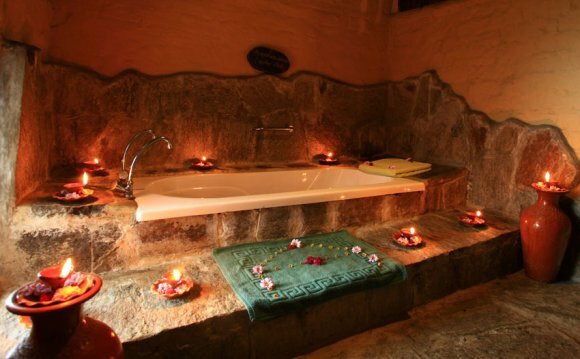 Ananda in the Himalayas is a destination spa in the Indian Himalayas. The word ananda means bliss and contentment, which is reflected in the spa's aim of promoting spiritual wellbeing.